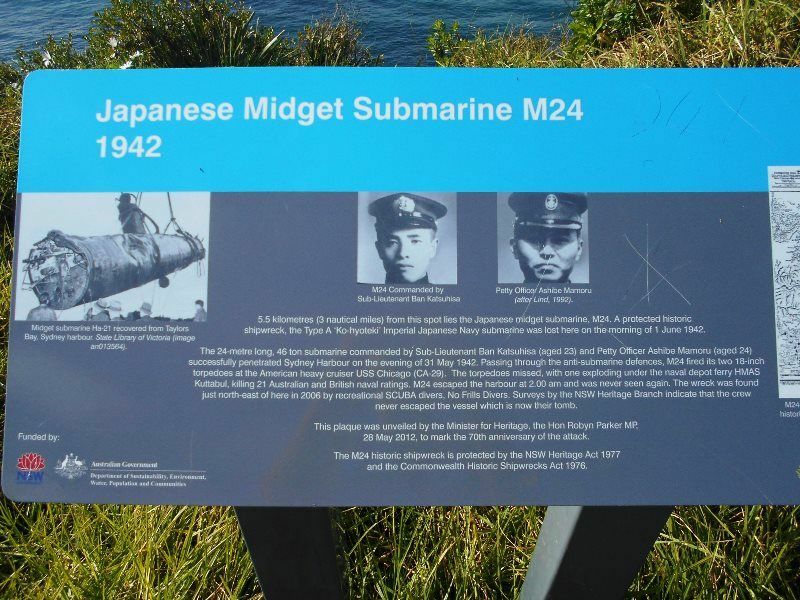 A plaque marks the 70th anniversary of the Japanese midget submarine attack on Sydney Harbour in 1942 during World War Two. The plaque documents the historical events of May 31 - June 1, 1942, when a special attack force of five large ocean-going submarines launched three midget submarines against warship targets inside Sydney Harbour. The site was chosen as its lies adjacent to the wreck of the only midget submarine surviving underwater from the raid, the M24. The archaeological wreck site is listed on the State Heritage Register under the New South Wales Heritage Act 1977, and also protected by the Commonwealth Historic Shipwrecks Act 1976. M24 was discovered by a recreational diving group, 'No Frills Divers' in 2006. 5.5 kiilometres (3 nautical miles) from this spot lies the Japanese midget submarine, M24. A protected historic shipwreck, the Type A `Ko-hyoteki` Imperial Japanese Navy submarine was lost here on the morning of 1 June 1942. The 24-metre long, 46 ton submarine commanded by Sub-Lieutenant Ban Katsuhisa (aged 23) and Petty Officer Ashibe Mamoru (aged 24) successfully penetrated Sydney Harbour on the evening of 31 May 1942. Passing through the anti-submarine defences, M24 fired its two 18-inch torpedoes at the American heavy cruiser USS Chicago (Ca-29). The torpedoes missed, with one exploding under the naval depot fery HMAS Kuttabul, killing 21 Australian and British naval ratings. M24 escaped the harbour at 2.00am and was never seen again. The wreck was found just north-east of here in 2006 by recreational SCUBA divers, No Frills Divers. Surveys by the NSW Heritage Branch indicate that the crew never escaped the vessel which is now their tomb. This plaque was unveiled by the Minister for Heritage, the Hon Robyn Parker MP, 28 May 2012, to mark the 70th anniversary of the attack. The M24 historic shipwreck is protected NSW Heritage Act 1977 and the Commonwealth Historic Shipwrecks Act 1976.